It only takes one bad experience to outshine the train of good service experience. No matter how superior or high-tech your product is, it is still crucial to understand the insights of the customer and have a clearer bird’s eye view of the entire service process to be able to focus on what is or is not working, or what needs to be improved or changed. Mr Santhanaram Jayaram – or Ram, as he prefers to be known, is a Business Communication coach and award-winning speaker who led the topic “Crafting Your Ideal Customer Service Blueprint” on August 24 during a workshop organised by STJobs. Among the participants who shared their experiences with dealing with customers, one in particular lamented the stress of having to do cold-calling and speaking to an unpleasant person on the other end of the line. “You must smile behind the phone, and when you do that, somehow it will resonate across to the person you are speaking with,” offered Ram. During a discussion on how to ensure that both the service personnel and client can enjoy a positive experience in dealing with each other, Ram pointed out that the key to collaboration was about holding an open dialogue that offers mutual feedback - in essence, embracing assertive communication. 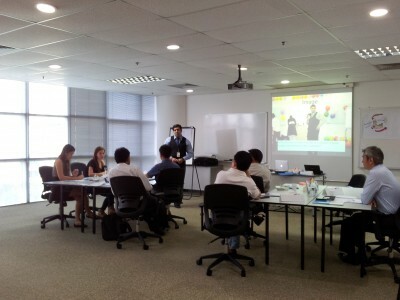 49-year-old Mr Vick T.R., a Learning & Development Consultant at 3L Consultancy Pte Ltd, was especially impressed by Ram’s unique video clips which he used to demonstrate his ideas to the participants. “The service blueprint methodology to use and apply what you have learnt is very useful,” he said.